Well I didn't win the make-up brush set, too bad. I probably wouldn't know what to do with those brushes anyway. Anyway, I've been trying to distract myself from the aches and pains. I've just ordered a couple of books from Amazon and had it sent to Johnny Air Retail which I learned about from Chuvaness' blog. Great alternative to paying the enormous international shipping fees! They charge $6.00/lb + $5.00 handling fee. And you don't have to wait for weeks for your shipment -- it arrives in 6 days. Perfect for when I'm already on maternity leave. I'm off to check out the HP Mini 1000 Vivienne Tam edition! Some women get jewelry when they give birth, I get techie products! (I got an Ipod when Faith was born). Then we're watching Wolverine. Me modeling my new dress in our messy bathroom. I figured I might as well take a picture for posterity. I just realized how huge my tummy is. Just a few more days!!!! Bought a crib yesterday and I think we're ready. But I haven't packed for the hospital yet! interviewer (female) even advised me to wear makeup because I looked too young. I can at least apply foundation and blush! Which brings me to why I am writing this post in the first place. Some generous soul at Beauty for a Living is giving away a free set of Shu Uemura brushes in a very pretty Mika Ninagawa kit. According to the blog: Shu Uemura describes this super pretty set: "Carry your brushes in a portable Mika Ninagawa work of art! Purple on the outside with a special Mika red rose photograph lining the inside, the limited-edition brush case includes a set of four Shu Uemura brushes, each handmade in Japan by professional artisens for optimal makeup application for the face, cheek, eye and lip." The set includes 4 brushes: goat brush for the face, pony and squirrel brush for cheeks, sable and kolinsky brush for eyes, and sable brush for lips. Now all you need to do is write about the contest, link the author's post and leave a comment on her blog that you've posted about the contest. It's open to all (not just the Philippines) and she will ship anywhere in the world. 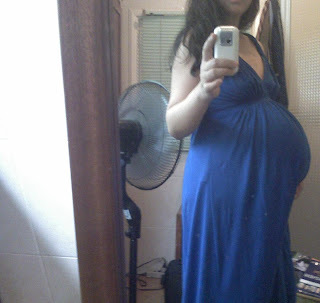 Just because I'm pregnant and about to pop doesn't mean I can't still be vain, right?